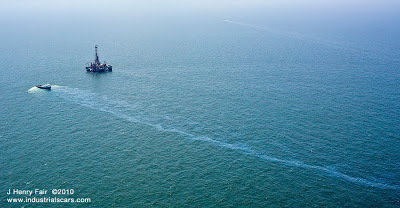 June 5, 2010: Oil slick next to Ocean Saratoga semisubmersible drill rig. Rig is working to plug leaking wells that were damaged by Hurricane Ivan in 2004. Photo courtesy J. Henry Fair. June 25, 2010: Oil sheen marked by orange buoy. Rig was not observed in the area. Photo courtesy J. Henry Fair. 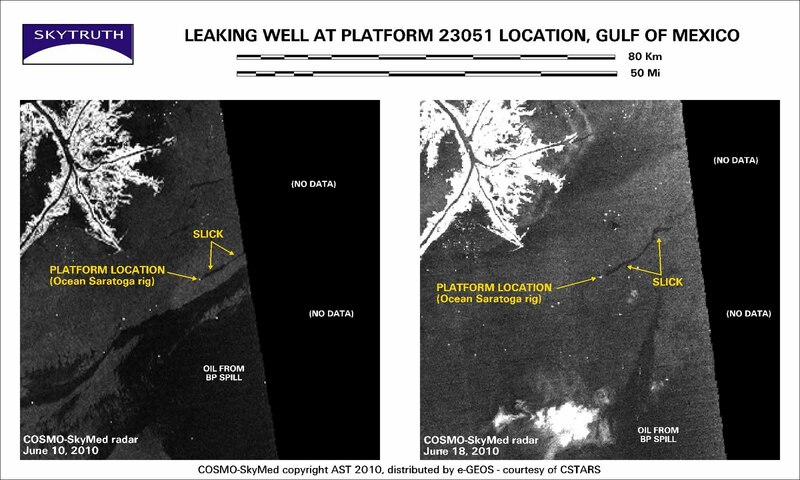 A few weeks ago we noticed a small but persistent slick on satellite images, appearing near a known oil platform location, designated Platform 23051 in a government database of all Gulf oil and gas platforms (including platforms that have been destroyed or removed). 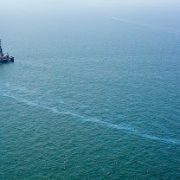 J. Henry Fair, a professional photographer, was flying over the site a few days later and captured photos and video showing an oil slick next to a semisubmersible drilling rig called the Ocean Saratoga. 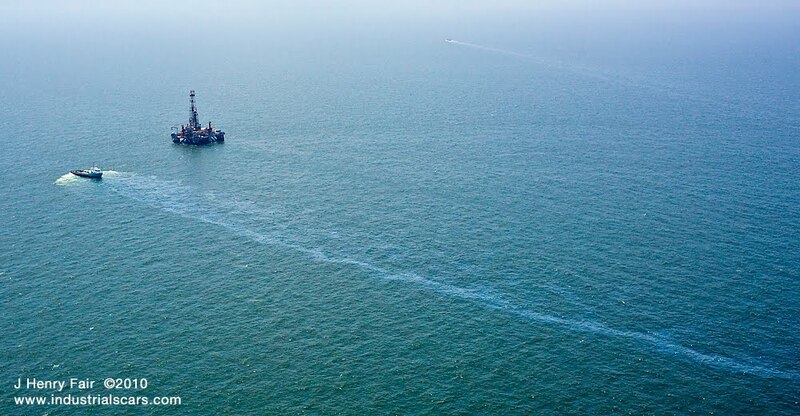 We learned the rig was not the source of any leak – it was working to plug one of 26 leaking oil wells that had been damaged by Hurricane Ivan in 2004, and have apparently been leaking ever since. Platform 23051 must have been destroyed during Ivan, or so badly damaged that it was subsequently removed. The Coast Guard reported the wells were leaking, on average, just 14 gallons per day; and a containment device was said to be capturing most of that oil. But based on the size of the oil slick, we calculated a leakage rate in the range of 100-400 gallons per day. In our most recent observation on satellite imagery, June 18, the oil slick is 12 miles long and covers 4.5 square miles. The Ocean Saratoga is apparent as a bright dot on the radar image near the western end of the slick. 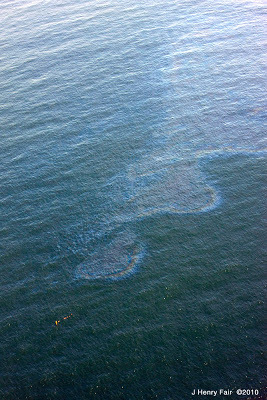 Mr. Fair flew over the site again on June 25 and took photographs showing a thin oil slick (rainbow sheen) marked by an orange buoy at one end, with no sign of the Ocean Saratoga rig or any other activity. It’s possible the rig was towed back to shore to ride out tropical storm Alex, or has been moved to another job. As long as we keep getting satellite imagery covering the nearby BP oil spill, we should have more opportunities to check up on the progress at stopping this small but persistent leak.